Stuffed teddy bears. Oversized balloons. Schmaltzy cards. This is the stuff Valentine’s Day is made of. And it’s the stuff that makes you want to throw up all over a box of candy hearts. You hate it, not because you don’t want to see your friends happy, but because it means one more year has passed, one more year in which you didn’t meet the man or woman for whom you’ve been praying. I’m sorry that today will be hard for you. I wish you didn’t have to see jewelry stores’ false advertising (To clarify, every kiss does NOT begin with Kay.) or Instagram photos of bouquets of red roses. And I hope that you aren’t alone on a Friday night, eating Doritos and watching bad chick flicks while all your married and dating friends are out eating sushi and making googly eyes at one another. But I have other hopes for you. I hope that people don’t make you false promises, that they don’t say things that are unhelpful, that you endure through all the “I just don’t get why you’re not married”s and the “Just as soon as you quit looking, you’ll find someone!”s. I hope that you pamper yourself just a little bit, that you feel a little sorry for yourself but not too sorry, that you pray instead of cry. I have prayers for you too. I pray that the Lord would comfort you, that He would cause you to see that His love for you is greater than monogrammed bathrobes and Hallmark cards. I pray that He would teach you through this suffering that you are to trust in and depend on Him alone and not on your family, your pastor, not even on the elusive spouse you are sniffling over right this moment. So this Valentine’s Day, when you are tempted to roll your eyes and sigh so loudly that your coworker three cubicles over can hear you, when you come dangerously close to cramming a heart-shaped box of chocolates down your engaged sister’s throat, know that God’s plan for you is good. It is so good that it is perfect. It doesn’t feel like it, not now. Some things–like why our Lord gives spouses to some and not others–remain a mystery. And mysteries always leave us feeling a little unsettled. But His love for you is no secret, no joke. It is completely transparent. It is Christ . . . with a full cross and an empty tomb . . . and it is yours for free, no helium balloons attached. And that love–His for you–is better than any bottle of wine or wife or steak dinner or boyfriend you’ll ever receive. That’s the stuff of Valentine’s Day: Christ’s love, a love so great that Scripture bids husbands to model it for their wives. But you? You don’t even have to mimic it. It’s yours. Already. Even now. Even today. The highest thought in this Gospel lesson (John 2:1-11), and it must always be kept in mind, is that we honor God as being good and gracious, even if He acts and speaks otherwise, and all our understanding feeling is otherwise. For in this way feeling is killed, and the old man perishes, so that nothing but faith in God’s goodness remains, and no feeling. For here you see how Jesus’ mother retains a free faith and holds it forth as an example to us. 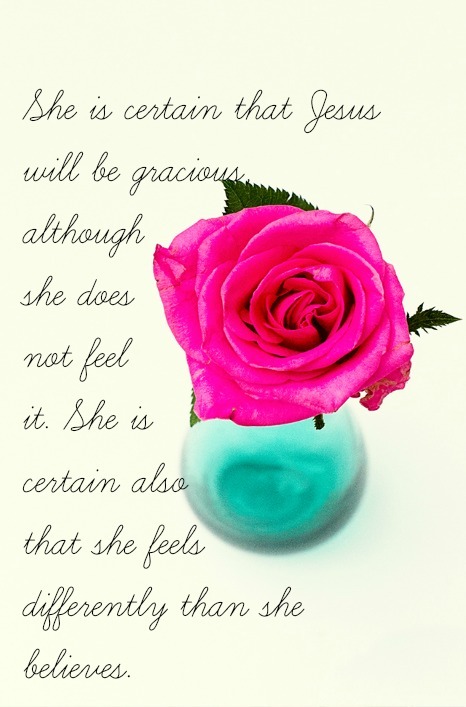 She is certain that Jesus will be gracious, although she does not feel it. She is certain also that she feels differently than she believes. Therefore she freely leaves and commends all to His goodness and fixes for Him neither time nor place, neither manner nor measure, neither person or name. He is to act when it pleases Him. If not in the midst of the feast, then at the end of it, or after the feast. She says, “I will swallow my defeat, His scorning of me, letting me stand disgrace before all the guests, speaking so unkindly to me, causing all to blush for shame. He acts sour but He is sweet, I know.” Let us continue in the same way. I’ve read you’re blog for a while, and frankly I’m tired of all the advice you try to give single people now that you’re married. As someone who was single late into your twenties, you should know first-hand how hard it is to be single. Get off your high horse for once. High horse? I don’t even own any equines! 🙂 And for the record, it’s the same advice my parents gave me and I gave myself when I was single. It hasn’t changed, even if my marital status has. Happy Valentine’s Day!